There are few things more frustrating to one attempting to restore and maintain native habitat than the reality that an invasive species cannot be reasonably and responsibly eradicated. Such is the scenario in the wet meadow that dominates “The Acre”. 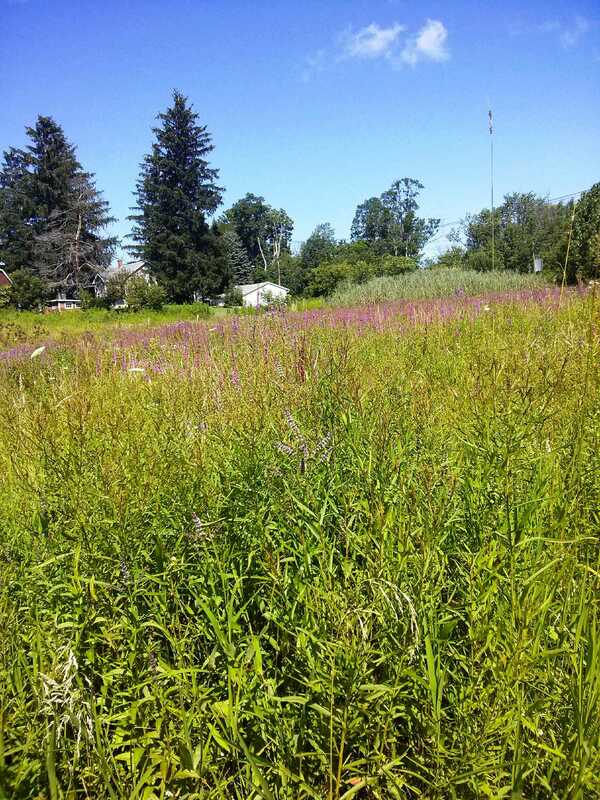 When first moving to this property in 1999, the wet meadow was more or less a happy balance of both native and alien plant species. Notable, however, was the lack of invasive species, with the lone exception of Spearmint (Mentha spicata) which created a bright green carpet along the drainage path leading off to the West Branch of Cazenovia Creek, a major channel within the Buffalo River Watershed (this area’s dominant drainage system). Most open field plant species are alien, long ago (2 centuries at least) having usurped the native populations. Historically, one has to question the actual identity and dominance of open field native species as both Indigenous tradition and Colonial documentation consistently agree that this area was overwhelmingly deeply forested, so much so that the Onödowa’ga:’ (Seneca) peoples had to clear forest land to practice agriculture. (If told I’ll live to 120, perhaps this question could spur doctoral research). In the intervening 13 years, the wettest portions of the meadow have seen dramatic change in the plant community, which is most telling as mid-Summer progresses. The colors of white, yellow and crimson have receded and the color purple has inundated the moist areas. And by that I mean Purple Loosestrife (Lythrum salicaria). When the Loosestrife first began appearing, heroic attempts were made to pull it (heroic because it is notoriously difficult to uproot). When it became clear that this type of manual control was not enough, the procedure was augmented with dead-heading what could not be yanked in order to control seed production. Dozens of hours were spent in this hot, wet field accompanied by resident mosquitoes in hopes of limiting the spread. Huge piles of plant material were dried, eventually becoming tinder for the fire pit. This exhausting process seemed to work for a couple of years but the last few have brought the reality that continued dispersal of seed via road drainage has allowed the Loosestrife to take over. There is no way to control for this and, so, the invader wins. I’ve resolved myself to keeping small patches near the meadow’s edge clear in order to allow re-introduced Common Cattail (Typha latifolia) to take hold and native Boneset (Eupatorium perfoliatum) to continue thriving. 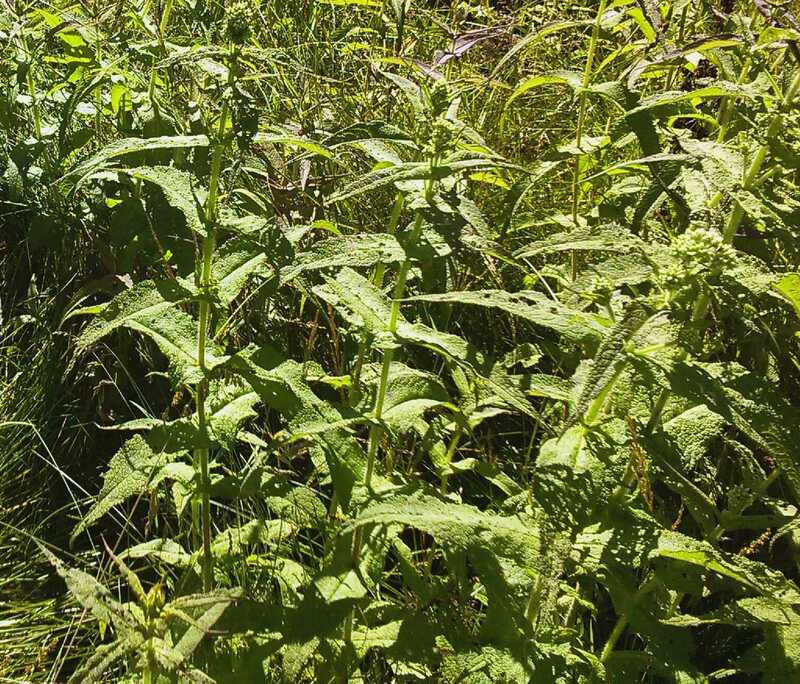 Boneset, a native medicinal, does well in many spots on “The Acre”. One positive note to somewhat assuage any guilt from this surrender is that the Bumblebees and small Butterflies are making use of the Loosestrife’s nectar. Perhaps, one day, our native critters will somehow adapt and become important factors in controlling this difficult, albeit beautiful, invader. Other factors that help me to accept this defeat are the points brought up above. Certainly #1 helps to clear my name in that the problem of invasives is older than the nation itself. Point #2 tells me that time and succession itself will one day be the ultimate solution as the field slowly progresses into a wet woodland. More Green Ash (Fraxinus pennsylvanica) and Red-Osier Dogwood (Cornus sericea) appear each year so the process has already begun. In the meantime, the next invasive project involves that looming stand of Phragmites (Phragmites australis) in the background of the above photo. I hold firm that THIS species will not win as shading with water and salt tolerant trees is the plan of action (serving, also, as a little push along the path of succession). This entry was posted in Botany, Ecology, Nature Education, Science and tagged habitat, invasive species, loosestrife, nature, plants, wetlands. Bookmark the permalink. Have you considered feeding the loosestrife to beetles? Not quite sure of your meaning, Don. Thank you for sharing your meadow and its challenges with us. Good luck on your work. Yellow star thistle is the enemy here, with its slow and steady encroachment over everything.